The revelation last year that Marilee Jones, the dean of admissions at the Massachusetts Institute of Technology, falsified her educational credentials nearly 30 years ago is a timely lesson for this year’s crop of college graduates about to embark on their careers this spring: lies on resume may escape notice, but if discovered they can be devastating. Jones, who admitted to never earning an undergraduate degree, joined the largest group of transgressors when it comes to résumé boosting. Most misrepresentations will go undiscovered since a majority of résumés are never checked thoroughly. When résumés are checked, some might be surprised at the amount of misinformation found. While no official statistics exist, some experts estimate that at any given time as many as 10 percent to 30 percent of all job applicants distort the truth or fabricate outright on their résumés. ADP Screening and Selection Services in Fort Collins, Colorado, reported in its 2007 hiring index that 41 percent of employment, education and/or credential reference checks conducted in 2006 found discrepancies between what the applicant provided and the source reported. That is down from 2004, when half of the resumes it check contained discrepancies. Do not assume that résumé fraud is only perpetrated by young, inexperienced job seekers trying to gain an edge over more seasoned candidates. Some of the most notable examples in the last few years have been top-level executives, including chief executive officers and chief financial officers. According to the Challenger ranking, education is the No. 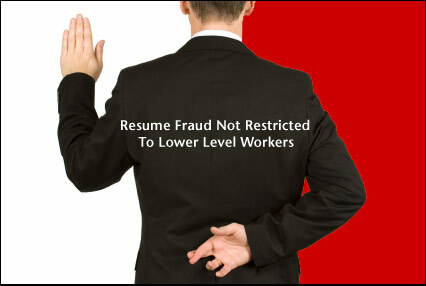 1 area when it comes to résumé fraud. There are some who will go as far as saying they graduated from a particular institution when, in fact, they never attended a class there. What is most commonly found is the applicant who actually attended the school and may have been very close to graduating but, for whatever reason, did not finish with enough credits for the degree. The person, figuring that missing a handful of class credits is not a big deal, lists the degree on his or her résumé. Ironically, the absence of a few credits probably would not make a difference to many companies, but lying on the résumé certainly will. In fact, if the reason for leaving school early was compelling — such as ‘a parent passed away and I had to go to work to help support the family’ — it could be a significant selling point in an interview. The second most common area for résumé fraud is boosting one’s former job title, which goes hand-in-hand with the next most popular fabrication: not telling the truth about how much money one makes. Job seekers try to increase their earning power by inflating their current or former position and salary, speculating that a prospective employer will not offer less money. Some job seekers may do this because they feel that they should be a vice president and earning six figures, but their employers have not acknowledged such capabilities. However, prospective employers do not care whether you should be at a certain level; they only care about what position you actually held. These are probably the most difficult areas for employers to check since many companies today will only confirm the most basic information about a person’s work history, such as dates of employment and position held. Additionally, reasons a person left or was discharged and the person’s accomplishments can be complex and abstract.